Unable and uninterested in controlling his baser urges since his transformation, Ga’rok has betrayed his employees often enough that no one trusts him anymore. What were once just rumors that enhanced his reputation as a dangerous warrior are now taken at face value as a warning to stay away. Ga’rok has never been particularly well-liked, but there was a grudging respect for his prowess and ability to get most of his clients to their destination. In the last few months, something has changed. 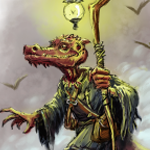 One too many times, Ga’rok has been the only survivor of a caravan run, and rumors of betrayal have been added to the previous concerns of cannibalism. What really happened is that Ga’rok had an unexpected run-in with a werewolf. He survived the encounter, just barely, but he contracted lycanthropy in the process. After several days of travel in the Wastes, the wind carried the smell of fresh meat. It had been weeks since Ga’rok’s last real meal. His stomach lurched. There was another scent: a wolf probably, mixed with the deer. Ga’rok thought for a moment that something was off, but he couldn’t place it and dismissed it swiftly. The deer carcass wasn’t too far away, and within moments, Ga’rok had come upon it. The only obstacle to his dinner was a single predator, a wolf. Ga’rok was downwind, and the wolf did not seem to notice him. Ga’rok moved in for the easy kill, thinking that he’d have both wolf meat and venison this evening. Overconfident, Ga’rok lunged at the wolf, planning to slake his blood-thirst by ripping the throat from the other carnivore with his jaws. He struck true, but the wound healed as soon as it had been made. What had seemed an easy meal only a few moments ago became a struggle for survival between the beasts. After the initial shock, Ga’rok’s rage and experience eventually turned the tide, but not before suffering grievous wounds himself. He lay, exhausted and bleeding on the ground after the battle. The next morning, he awoke, fully healed and seemingly stronger than ever before. In Ga’rok’s eyes, his condition is a blessing from Laughing Nkishi. A blessing to revel in, to celebrate and to share. Keen Hearing and Smell. 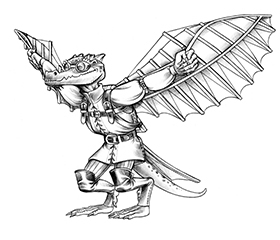 Ga’rok has advantage on Wisdom (Perception) checks that rely on hearing or sight. Rage (4/Day). Ga’rok can enter a rage as a bonus action. While raging, he has the following benefits: resistance to bludgeoning, piercing, and slashing damage, +3 damage to all melee weapon attacks, and advantage on all Strength checks and Strength saving throws. Rampage. When Ga’rok reduces an creature to 0 hit points with a melee attack on his turn, he can take a bonus action to move up to half his speed and make a bite attack. Shapechanger. Ga’rok can use his action to polymorph into a wolf-humanoid hybrid or a wolf or back to his true form, which is humanoid. His statistics are the same in each form. Any equipment he is wearing or carrying isn’t transformed. He reverts to its true form if he dies. Multiattack (Humanoid or Hybrid Form Only). Ga’rok makes two attacks: one with his bite and one with his claws or spear. Bite (Any Form). Melee Weapon Attack: +8 to hit, reach 5 ft., one target. Hit: 9 (1d8 + 4) piercing damage. If the target is a humanoid, it must succeed on a DC 12 Constitution saving throw or be cursed with werewolf lycanthropy. Claws (Hybrid Form Only). Melee Weapon Attack: +8 to hit, reach 5 ft., one creature. Hit: 13 (2d4 + 4) slashing damage. Vicious Greataxe (Humanoid or Hybrid Form). Melee Weapon Attack: +8 to hit, reach 5 ft., one target. Hit: 11 (1d12 + 4) slashing damage. When this weapon hits with a natural 20, the weapon deals an additional 7 slashing damage. Ga’rok Tok is enormous for a gnoll. Larger even than many of the females in his tribe. Filthy, matted fur covers his body, broken up only by the extensive patchwork of scars from old battles. What fur remains is dun colored, blending in well with the desert surroundings from which he hails. Ga’rok never wears armor. He considers it a sign of weakness and lack of skill. His hybrid form is similar enough to his normal appearance that characters that do not know him may not realize he is anything other than a very large gnoll. 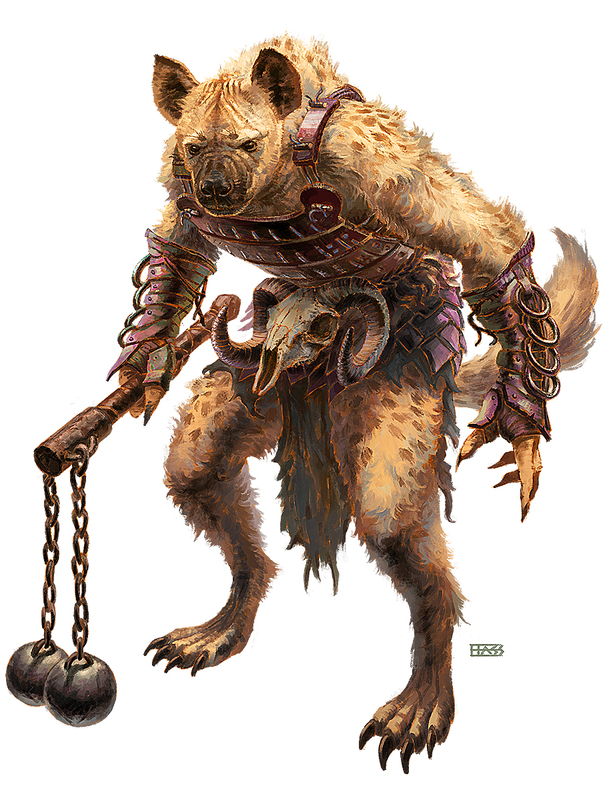 Ga’rok spends almost all of his time in his hybrid form, only assuming his gnoll form when absolutely necessary. His lupine form resembles a hyena more than a wolf and is used only if he needs to travel large distances overland. It would be very hard for most adventurers to piece together that Ga’rok is a lyncanthrope, especially while he is raging: the tell-tale vulnerability to silver is essentially erased when raging and his hybrid form is hard to tell from his regular form. Ga’rok never enters combat before raging and prefers to attack whatever target he feels is the most threatening to him. In many cases this is the group’s spellcasters. He fully trusts that his incredible durability will allow him to shrug off attacks from the party’s non-spellcasters. He’s not smart, but he’s clever enough to know that a fighter with a non-magical greatsword can be ignored while he gives his attention to a spellcaster. 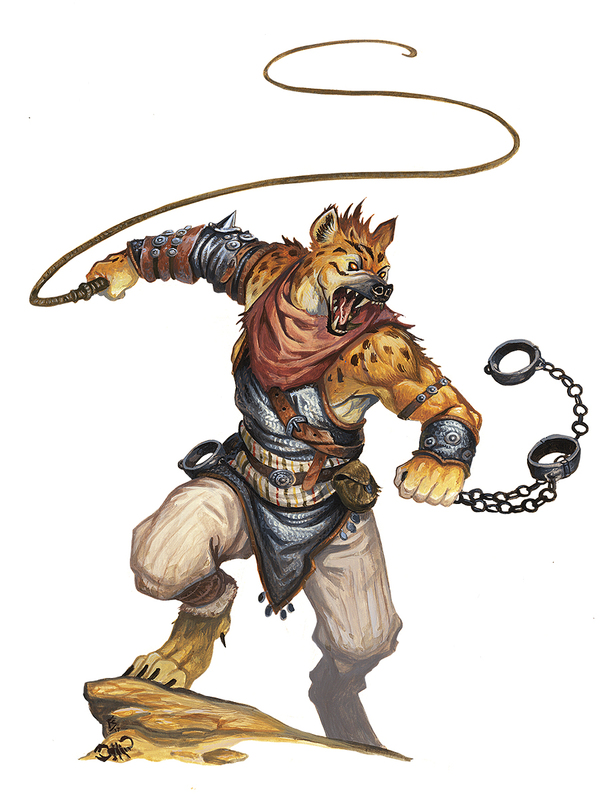 After Grimalkin: PCs that have completed Grimalkin or Cat & Mouse have been introduced to the extraordinary gnoll Princess Karima Gamila, who is well-known among gnolls and has come to the attention of Ga’rok. Karima has asked the PCs to help her (once again) and to provide protection from Ga’rok. She doesn’t know that he’s been infected by lycanthropy, only that he is uncontrollable and dangerous. Random Encounter in the Wastes: Ga’rok traveling by himself can be a very challenging adversary. The difficulty depends heavily on how your players are equipped. If they have the forethought to have silvered weapons or if they’re well equipped with magical weapons, they may be okay. If that’s not the case, there may be trouble. Bar Fight Gone Horribly, Horribly Wrong:The title says it all. This could be very lethal, very quickly. Let’s hope there’s a mid-level monk in the group. The weapon damage is wrong if he’s using a great axe. A great axe is 1d12 but a battle axe is d8 or d10 two handed as written above. You’re absolutely right Shawn. Thanks for the heads up! I hope you enjoyed the NPC. Thanks for these NPCs! I really enjoy DMing for my kids but I don’t have a lot of prep time so things like this are really helpful. I’ll keep Ga’rok in my back pocket for when they are traveling the desert next! Glad you like it. More to come!